Its been raining. It's raining right now actually and I am willing to bet a pound to a penny, that when you read this, it'll be raining too. Even the FSF ducks, usually stalwart enough to sit on the pond regardless of the weather, have got fed up and moved inside. When the weather is like this, the question is how do you provide your precious girls with a dry area for them to scratch about in outside? There is nothing that looks more sorry for itself that a wet, bedraggled chicken. 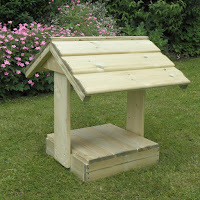 Here are three ideas for providing your hen with a little shelter from the wettest June in a long, long time. Rainshades for Chicken Runs are large PVC rainshades for attaching to your chicken run. Perfect for protecting an area of your run, they measure approximately one metre wide by two metres long, and are held in place by four strong bungees that simply hook onto the weldmesh of the run. Meaning if you wish to move the rainshade or remove it entirely, it is the job of but a minute. Providing shelter from torrential rain (very likely) or an area of shade from the summer sun (less likely) the rainshades are a versatile, movable and simple solution to providing a sheltered and dry area to any run. 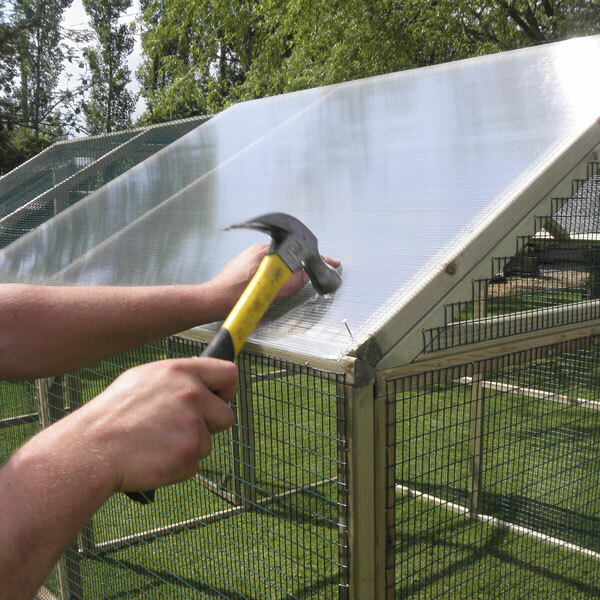 Made from a transparent 6mm twin walled UV stable polycarbonate, this roofing provides a permanent option to keeping your hens dry. Affixed to the existing roof panels with polypins, the roof not only sheds the water to the side of the run providing a dry area beneath, but also prevents contamination by wild birds of your feeders and drinkers. 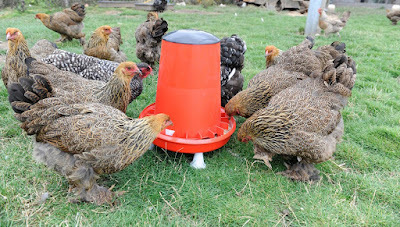 The Polycarbonate Roofing can be cut to fit nearly all of Flyte so Fancy's runs and with the addition of a silicone tube and gun for the joins, provides a permanent option for protecting your hens from incessant down pours. If you have your flock in a large paddock or free ranging, then roofing simply isn't an option, but that doesn't mean that you can't provide them with some isolated islands of protection from the rain. 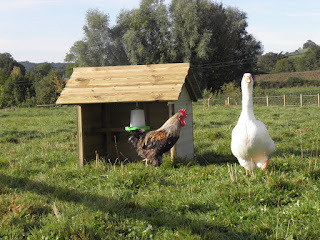 The Chicken Shelter is a simple weather shelter, built from our sturdy pressure treated timbers, to give your hens somewhere to go out of the rain. With a perch inside for day time naps, hooks for hanging treats, feeders and drinkers, the overhanging roof provides maximum protection from the elements. 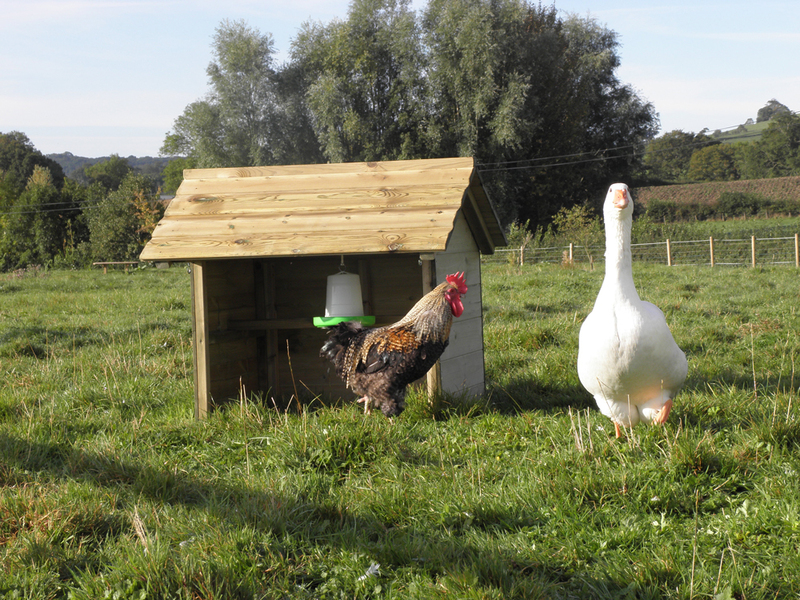 Available in three sizes; Small, Large and Jumbo (which is very big) the Chicken Shelter is ideal for providing dry havens for your hens. With the weather map for next week looking no better than it was for this week, now is the time to provide a little shelter for your hens from the elements. If you have a question regarding one of these options why not leave a comment below or call us on 01300 345229. The rain has been hammering down on Flyte so Fancy's corner of Dorset over the last few days. I'm talking about raindrops falling so quickly, they are hitting the ground, bouncing back up in the air and falling again. The thing is, here at Flyte so Fancy, we're still wearing shorts and t-shirts despite the heavy downpours that are falling and hot, humid weather can only mean the return of red mite. Hot, damp weather is the ideal conditions for red mite, they love it, so now is the time for paying extra attention inside the coop. Elbow grease, the right products on the shelf and a sharp eye for the tell-tale signs of an infestation will mean that you can prevent or kill any mite that take up residence in your coop. If your girls are reluctant to go into their hen house at night, its probably because they know what is waiting inside for them. A chicken not wanting to go to bed at night is the surest sign that red mite are inside your hen house. A red dust or detritus building up in the coop, the left overs from an industrial population of red mite. The vaseline trick. Put a smear of vaseline around the end of the perches, as red mite crawls through the vaseline some will get stuck, allowing you the next morning to see if there are any in your coop. Prevention is always better than cure. When it comes to your hen house, a little elbow grease and the right cleaners will see the issue taken care of before it even starts. 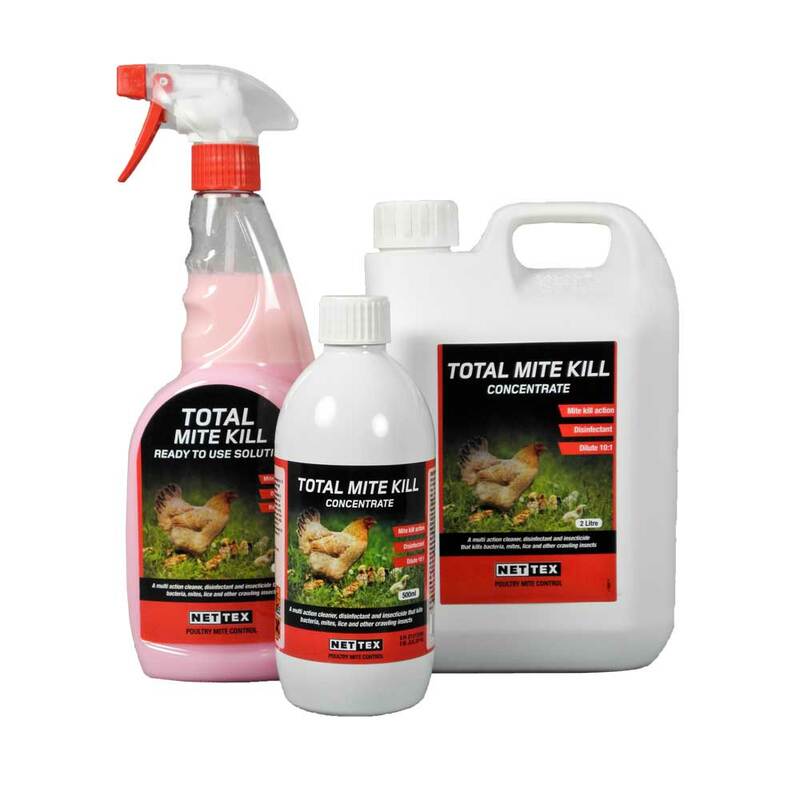 Flyte Mite Ready to Use Spray, is a an all round cleaner and disinfectant. Using an anti-bacterial action, it provides effective mite control, by removing the organic matter in your house that insects live and lay there eggs in. 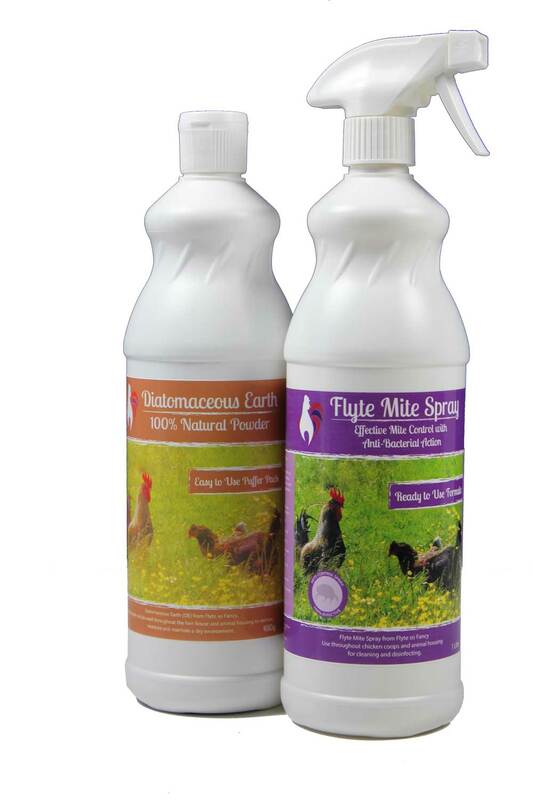 Flyte Mite Spray should be used in conjunction with Diatomaceous Earth. Used throughout the coop, it removes moisture and the damp areas where mites, moulds and lice can thrive. Traditionally Diatomaceous Earth has been used against parasites such as lice, fleas and mites as a preventative treatment. Sometimes, despite you best efforts, red mite will still take hold in your hen house. When this happens it's time to upgrade your cleaner and take care of the issue. Net-Tex Total Mite Kill is a multi-purpose cleaner and insecticide, containing permetherin for rapid knockdown of the pests inside your coop. As well as killing mites and lice, it will also kill off bacteria and viruses. Organ-X Mini Insect & Mite Smoke Bombs are highly effective fumigators for clearing all types of insects from inside poultry housing. Simply remove the birds from the house, seal it up tight and then set a fumer off. Once you have left it for a few hours, open the coop right up and give it a good clean through. Red Mite can show up any time, but the hot, damp weather that we are currently experiencing is a particular favourite of theirs, so around this time of year it is best to be vigilant and if you see any, to take care of them quickly. If you have any questions about red mite or how to best to get rid of an infestation from your hen house, leave a comment below or call us on 01300 345229 to speak to a member of our team.